So I did a lot more thinking about the computer. This is a follow-up to the story that Nokia is now legitimately considered a computer maker, not for all phones, but for its smartphones (as is Apple for the iPhone, RIM for the Blackberry etc all smartphone makers). And I reported that when smartphones are included in the total count of all computers sold in 2008, RIM becomes the seventh largest maker, ahead of Toshiba who invented the laptop; Apple jumps ahead on the charts past several "pure PC makers" due to its iPhone and iPod Touch, to fourth biggest computer maker, but the biggest, is no longer Dell or HP, it is now Nokia, purely by the volume of how many smartphones it sells. I've engaged in a good discussion over at Forum Oxford about how fair it is to consider a smartphone a computer today, in 2008, and there is dissent over there, but a lot of acceptance. Its hardly a "neutral" environment for such expert views, however, being a mobile related group, who are more prone to accept mobile related views.. So I put a comparison of five types of computers, by generations if you will (this is not the same classification as the computer industry has, for they have more generations in the mainframe era for example. But I think this illustrates the trends well. Here is my summary as a table. Several definitional issues I need to cover, some terms are a bit cryptic in the table and some need a clarifying note. First, most of the statistics are for a "typical installation at about mid-point in the time period". So when you see the Desktop PC column starting at 1974, the specs listed are NOT for 1974, they are for about 1981, an IBM PC for example. Same for the laptop era, not the first Toshiba 1000 from 1985, but rather a typical IBM Thinkpad from about 1993. Also very importantly, note that the typical computer innovations of a newer era, can often include upgrades to older types of computers. So after 1985, the older (Desktop PCs) got many of the features and functions of the laptop PC era. Same with the smartphone era, many desktops and laptops have some of those features now. The size is the total space needed by a typical installation. Thus a desktop PC setup, as typical around 1981, had a minimum of three units, a desktop CPU unit, a separate monitor and a separate keyboard. Very typical was the printer, and also often a tape storage cartridge, a separate second floppy drive, perhaps a separate hard drive, and possibly a separate modem, etc. MIPS is a computer processing speed term Millions of Instructions Per Second. It is now considered an archaic term with more relevant measures, such as MegaFLOPS (don't ask..) but MIPS is the only way we can compare computer performance across 65 years. I've indicated the typical top speed at a given point in time which is indicated. Input. On the smartphone input I have motion meaning motion sensor like in the iPhone, the N82, etc. Output. The desktop PC output I've indicated B/W text display and printout. That means the monitor was typically monochrome and the monitor display from typical programs was in text output mode, so we didn't see pictures and graphics unless you had a more expensive graphics card installed in the computer and bought a graphics-compatible display like an EGA or VGA monitor to your PC. Also on output I have internet for the smartphone era. This means we now can output directly to the internet, such as our pictures to Flickr, our blogs and Twitters and Qiks etc. Users. On the desktop PC era I say PCs can have 1-3 users, that means for example a family may share a computer or at the office our secretary could use our computer as well as we did, etc. By the time of the laptop era, the assumption is that laptops are semi-personal, we don't expect to share them. On smartphones I say person has 1-2, meaning a typical smartphone user may easily have two phones, say a Blackberry and an iPhone. OS. OS means Operating System. On the custom computer era I say no OS. By that I mean, the application and operating system was one and the same, there was no distinct OS as such. GUI means Graphical User Interface, ie Mac OS or Windows. On the smartphone column when I say mobile, I mean a mobile (and simplified) variant of typical PC OS's like Windows and OS/X (Macintosh) and Linux. Or mobile-specific OS's like Symbian. Apps. Apps means applications as in software applications. On Mainframes I say progr. lang. which I mean programming language based apps. A language compiler like Pascal, Fortran or Cobol was used and programs written on those languages. Killer app. Means Killler Application, what was the reason to buy a whole computer system. Focus. Nation sec means National security, ie nuclear weapon design or cracking enemy spy codes etc. Network. BBS means bulletin board system, a smaller network of often localized connections, used for email, chat groups etc. a network before the internet. WAP means Wireless Applications Protocol. Most phones have WAP and most users think this is the "mobile internet", and it tends to be tightly controlled by the mobile operators, a kind of walled garden. Reach. I couldn't think of a better term. I mean if you wanted to move your computer, what is the practical range you can move and still maintain a connection. With a desktop, you can move your PC to the other table, if the phone line is long enough. With a laptop on a WiFi connection, it is roughly one large room (at a time). But with a smartphone is it even as big as a whole nation, with your standard tariff, and international, if you're willing to pay international data roaming charges. Population. Very important, the columns describe the growth from and to, in that period, including ALL computer types during that era. The 2001-2008 column for smartphones includes mainframes, desktops, laptops and smartphones. Note first, that every trend in every dimension, goes in the same direction. The computers have become smaller, lighter, simpler, easier to use, with more ways to control them and to get outputs, with better connectivity. Computers need less trained people, and less people to operate and computers cost less and perform faster. In every trend there is a similar leap from the start of the PC desktop era, to the laptop PC era, and now from the laptop PC era to the smartphone era. Not much greater leap, very similar leap. And compared to the mainframe era vs the desktop PC era, the changes were far more dramatic than now comparing laptops and smartphones. 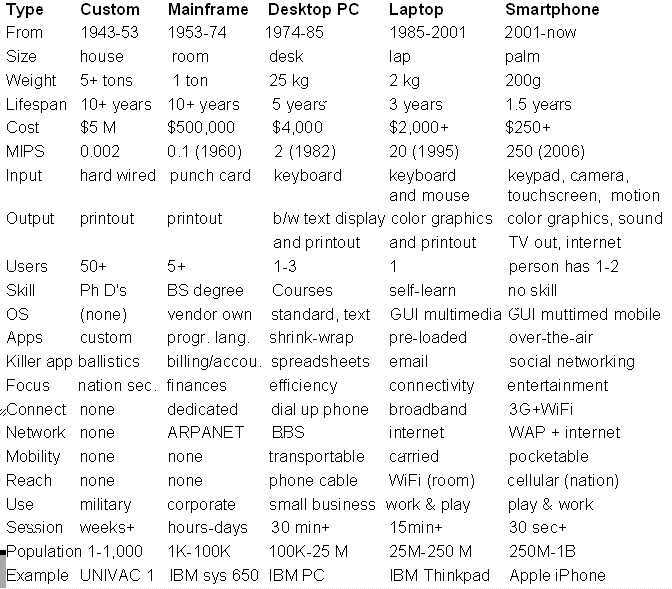 If you compare the difference between a smartphone today and the column for the laptop era, I argue it is no different than any of the previous transitions. Not by ANY of the criteria. We've always had similar, disruptive and at times traumatic shifts to the industry, and this is a natural progression on this path. But yes, study the table and do give us your comments. I defy anyone to do the graphic arts I can easily do on a desktop or laptop on a screen the size of a postage stamp. Other than that (screen size), the comparisons are probably quite valid. Good points, and I very often have that very same discussion, what is the role of the "small screen" of the mobile phone when compared with that of a laptop or desktop computer. So, let me first agree with you. I use a laptop right now to chat with you, even though I also have two good smartphones, and both have (free) wireless connectivity so I need not sit here at my desk with my laptop. Why use the laptop? Because it is more comfortable to do longer periods of work, when we have a good size screen and solid real keyboard, not just the tiny ones on the best of smartphones.. So yes, there are special "semi-professional" needs where a PC based computer will "forever" be superior and preferred for "work" and serious play. Yes, I agree with you. I would not think of doing any image editing on a smartphone even though they have some rudimentary image editing software on them. I'd far rather do that on my laptop. Now, lets take first the two thirds of the connected world which is not like you and me, Tomas. The developing world part of the globe, where they don't have laptops or desktops, but do have mid and high end phones, and do most of their surfing on phones. For them, there is no practical choice. Even a low cost notebook computer is simply too expensive. Beyond the reach of normal people. But they do have their phones, and they make do with it. Imagine if your PC was totally broken, it was a long weekend with no PC repair available, and you had to complete some task? In an emergency, you'd proabably be willing to attempt some quick-fix type jobs even on the smartphone, if that was the only tool you had available. And then there is TV-out. My N82 has TV-out, as did my previous N93 (and the iPhone 3G has TV-out). That means that we can hook the smartphone directly to our TV and use our giant plasma screen for our monitor if we want. Doesn't that now change the picture? But I agree with you, there will be a major market for the "real" PC and for serious use, professional use (journalists, photographers, video professionals etc) and for the serious semi-pro amateurs, yes they will be using real tools like a laptop into the fore-seeable future. But our smartphone? It can replace regular PC use and it is increasingly doing so.. Very good point. Yes, actually all early film-based cameras were very restricted in the format. You had to decide how many pictures you might shoot, 12 or 24 or 36 pictures, and most people would not want to develop a film that had been only partially used, so then old films might sit partially exposed in a camera for a year or two etc. Very inconvenient. On a digital camera or cameraphone, we can consume images one at a time.. It sounds great that the biggest, is no longer Dell or HP, it is now Nokia, purely by the volume of how many smartphones it sells. I think same is with the smartphone era, many desktops and laptops have some of those features now. If the screen size is your measure, I think this solves it, as these small phone-based projectors do make bigger screen sizes than the 13 inch display on my laptop right now. I think that's true nokia is the biggest computer maker and all the big brands are left behind and also we cannot even compare these smart phone with bigger systems and the features that smart phones had now laptops and desktops have! do most of their surfing on phones. For them, there is no practical choice. Even a low cost notebook computer is simply too expensive. Beyond the reach of normal people. But they do have their phones, and they make do with it. phone with projector is very good idea. I am eager to see it. This will completely revolutionary innovation. You do not have to give close look to your tiny mobile screen. Also resolution of the screen is also one better thing. Hope it's cost is not much and it comes in affordable price. Well Nokia has diversified it's field of manufacturing in phones only, they try to be number 1 in every field and technology related with phones. This means we now can output directly to the internet, such as our pictures to Flickr, our blogs and Twitters and Qiks etc. As trend is of smart phones and people are shifting from laptops to smart phones. This is right that Nokia is now biggest computer maker when these phones are concerned. I only thought that Nokia is biggest company in Cell Phones but now they are leading manufacturers in Computer as well. Well they are indeed really good ones and amazing too, I would say that Nokia wants to be one of the largest and most leading manufacturers. You have selected a very good topic to speak on. The comparison b/w smart phones and older somputer is very distinctive and indeed we all know the difference very well. from laptops to smart phones. This is right that Nokia is now biggest computer maker when these phones are concerned. I think Nokia really deserves this. Nokia is really concentrating more on mobile phones rather than other kinds of product in the market.